In stock -This product will ship today if ordered within the next 6 hours and 22 minutes. Green People Organic Children Berry Smoothie Shampoo is a sweet and fruity shampoo. Providing organic aloe vera with raspberry, vanilla and pineapple bursting with natural plant proteins & yucca for soft shiny hair that is easy to comb. Ideal for daily use on your child`s hair and scalp. Be kind to your child`s skin with this gentle and natural shampoo. This product is suitable for children who may be prone to eczema or psoriasis. Ultimate shine shampoo, jam-packed with natural goodness. Plant proteins give the hair essential nutrients and leave hair super soft. Have fun with bubbles – natural and rich foaming from Yucca. 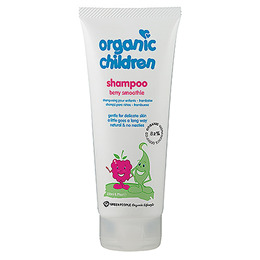 Green People Organic Childrens Berry Shampoo - 200ml. Aqua, Sodium Coco Sulfate, Cocamidopropyl, Betaine, Decyl Glucoside, Aloe Barbadensis leaf juice powder*, Chamomilla Recutita Flower Extract*, Yucca Schidigera Stem Extract, Ananas Sativus Fruit Extract, Triticum Vulgare Gluten, Aroma [Caprylic/Capric Triglyceride, Rubus Idaeus Fruit Extract, Vanilla Planifollia Fruit Extract, Aniba Rosaeodora Wood Oil, Salvia Sclarea Oil, Michelia Champaca Flower Extract, Ananas Sativus Fruit Extract, Pyrus Malus Fruit Extract, Rosa Damascena Extract Osmanthus Fragrans Flower Extract, Citrus Aurantium Bergamia Fruit Oil], Potassium Sorbate. Massage gently into your child’s hair and scalp. Rinse thoroughly. Avoid contact with the eyes. Below are reviews of Green People Organic Children Berry Shampoo - 200ml by bodykind customers. If you have tried this product we'd love to hear what you think so please leave a review. 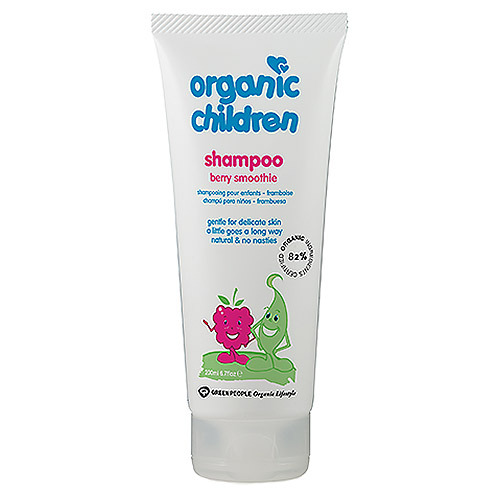 Green People Organic Children Berry Smoothie Shampoo is a sweet and fruity shampoo. Providing organic aloe vera with raspberry, vanilla and pineapple bursting with natural plant proteins & yucca for soft shiny hair.